We had a fun Thanksgiving trip to Kentucky. We had Thanksgiving with my parents. It was nice to have them all to ourselves for a change. It seems the last couple trips have been so crazy we really haven't been able to visit much. Tonya and her family got home from AZ on Friday night and we had a couple days with them before we left. The kids were super excited to see their cousins. They could barely sleep the night before with all the anticipation. Saturday we went downtown Cincinnati and went ice skating. It was such a fun setting... to be outside in the open surrounded by the lights and the Christmas tree. What a fun city. The kids struggled with skating and the adults were a bit worn out by the end, but they are already talking about skating again. It was a fun, memorable Thanksgiving weekend. I'm so glad we went and I'm so thankful to have such a wonderful family! Looks like you all had fun. 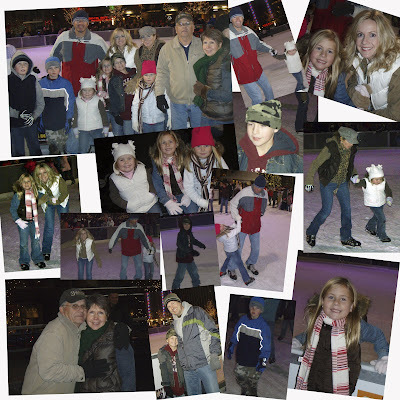 I havn't been ice skating in forever! I love the new header super cute pics C:! I love the pictures of the kids on the top of the page, they are so cute. It's nice to get one on one time with your parents. I usually always have at least 2 other families here in Arizona visiting at the same time but, we are it this time. I love all the one on one time we are having. Talk to you soon. What a fun time. I too love the christmas pics! Cute. By the way, I'm getting a cold again! I tried the apple cider vinegar a couple times and I really think it has helped, but I have such a sensitive gag reflex, it's always scary!